Anyone with young children should maybe head for Edgbaston Stadium tomorrow. There’s bouncy castles, face-painting, a climbing wall and a gladiator duel. It is even rumoured that there may be a cricket match as the Yorkshire Vikings are on the way to Birmingham. The event is being badged as All Stars Day with the purpose of supporting and rewarding young cricketers aged five to eight-years-old in the Midlands region. It may be a good idea for spectators to get to their seats early. Half an hour before play is due to begin, the Red Devils parachute display team are due to drop in to deliver the match ball. It is, of course, perfectly possible that Adam Lyth or Ed Pollock will deposit that ball out of the stadium in the first over of the match so hopefully the Devils will bring plenty of spares. The North Group of the Vitality Blast is already looking as if it will be keenly contested. Five of the nine teams have won one and lost one so far. Only Worcestershire Rapids, who narrowly beat the Bears on Friday night, have won both of their games. Yorkshire have played just once and scored at ten an over to defeat Durham. The key men are Brookes and Brooks. For Birmingham, young Henry Brookes provides real pace. If he can nip out a couple of the Vikings’ star batters early on, he can tilt the whole balance of the match. Of course, he is bound to have his off days and it will be interesting and potentially just as decisive to see how he deals with someone such as Lyth or Tom Kohler-Cadmore if they manage to collar him. The so-called ‘Headband Warrior;, Jack Brooks, played his first T20 game for three years for the Vikings against Durham. He took three key wickets and half his 24 deliveries were dot balls. He is not likely to have to wait another three years for his next game. Birmingham are likely to select from the same squad of 14 players that they named for their first two games, Dom Sibley, Boyd Rankin and Josh Poysden being added to the eleven who played in the win at Trent Bridge and the narrow defeat at Worcester. Most teams, if they have one, play a leg-spinner in the Blast but so far the Bears have kept Poysden on the sidelines. Maybe he will get his chance on Sunday. For Yorkshire, Tom Kohler-Cadmore will have a fitness test on an injured back so Andrew Hodd has been added to the squad of 13 in place of Josh Shaw. Yorkshire’s England players will be unavailable because of the deciding IT20 game against India. The two debutants against Durham, Harry Brook and Jonny Tattersall, both did well enough to keep their places. Sunscreen is the order of the day, with the temperature maybe hitting 30 degrees. The continuing dry, hot weather is starting to pose challenges for groundsmen so it will be interesting to see what Gary Barwell and his team manage to produce. 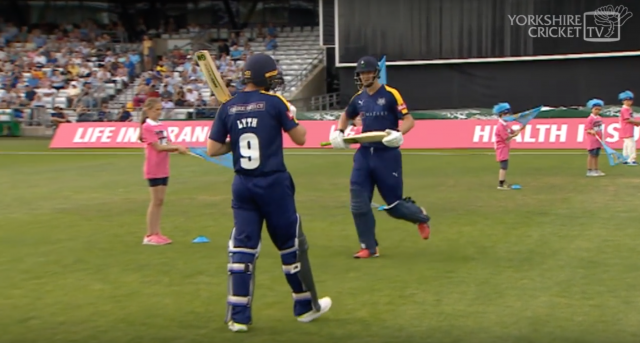 Most likely it will be a true pitch with plenty of runs on offer – but maybe there will be a hint of spin for the likes of Jeetan Patel and Azeem Rafiq. But can Pollock stay at the crease for any length of time?